Bind the beauty of Christ's sacrifice to your heart and mind with this stunning white gold cross pendant. Apples of Gold brings the simplicity of the cross into a new dimension of fashion with this gold cross pendant. Crafted of 14K white gold, it brings a thoroughly modern flair to the pendant. The cross is given a rope-like look with the twisting texture of the ring. This interesting design makes wearing a reminder of your faith fun and fashionable all in one. 17mm x 11mm (11/16" x 7/16"). 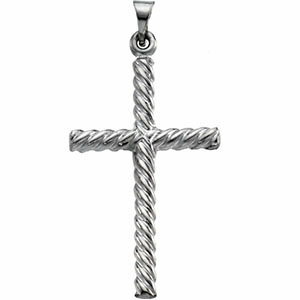 We guarantee our Swirl Cross Pendant in 14K White Gold to be high quality, authentic jewelry, as described above.